To worship God with sincere expression, to share the Good News of Jesus with others, to connect with other believers in meaningful relationships, to prepare disciples to fulfill their purpose, and encourage leaders in their God-given destiny: this is the purpose behind the fastest growing church in Birmingham, AL, Church of the Highlands. And the musical force that communicates and carries this message through its worship leaders, songwriters, and songs is Highlands Worship. Worshiping God with sincere expression and honest frailty in their debut release Place of Freedom, Highlands Worship is proving to be a fresh lyrical powerhouse within the worship community. Continually focusing on the people of the local church, Highlands Worship is constantly training musicians and worship leaders, and writing songs of freedom and love with a fresh approach. This idea creates a stage of approachability not only during Church of the Highlands services on Sunday mornings, but through the twelve new worship songs on the album, Place of Freedom. On September 18, 2012 Place of Freedom will release through label partner in:ciite Media and EMI-CMG Distribution; Highlands Worship will join the roster with other notable worship leaders such as Travis Cottrell, Don Moen, Gateway Worship, and Lenny LeBlanc in helping build God’s kingdom by creating remarkable experiences through media products and events that are culturally and spiritually relevant, the vision and mission of in:ciite. Recorded live from Church of the Highlands, Place of Freedom contains twelve original worship songs written by a team of talented songwriters in the Highland’s community and is also available as a deluxe version on iTunes with bonus track and videos from the night of the recording. 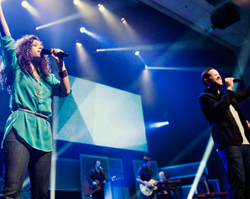 An incredible new conduit for worship music to reach churches across the world is here; Highlands Worship delivers songs that will resonate with churches and individuals. Engaging audiences through the power and authenticity of a live-recording, Place of Freedom follows the tradition of Church of the Highlands’ with the intimacy of Spirit-led worship and exemplifies the movement of an approachable, life-changing worship experience with God. For more information on Highlands Worship, visit them on the web at highlandsworship.com. Listen to sample audio clips of the songs on Place of Freedom HERE.